A major conflict has broken out in the Austrian state of Styria (Steiermark) and threatens to have ramifications across the whole Alpine region (well at least where cow-bells are used). Two families in the village of Stallhofen (in the Styrian county of Voitsberg) found that their nights were being unacceptably disturbed by the sound of cow bells in the fields close to their homes. They considered that the disturbance gave them adequate grounds to take the cows to the court of the Stallhofen district commissioner (Bezirkshauptmannschaft). Their claim against these grazing ‘hoodlums’ was successful; the cows have been given a fine of 100 euros and have been instructed to take off their bells when they are grazing near to these homes. For anyone who has lived in or near the Alps it will be easy to appreciate that this decision has raced across this peaceful countryside like a raging tsunami. Regularly, when I am in my alpine apartment I hear the local cows ringing their bells in glee as they are taken across the village at the crack of dawn to their succulent new pastures. 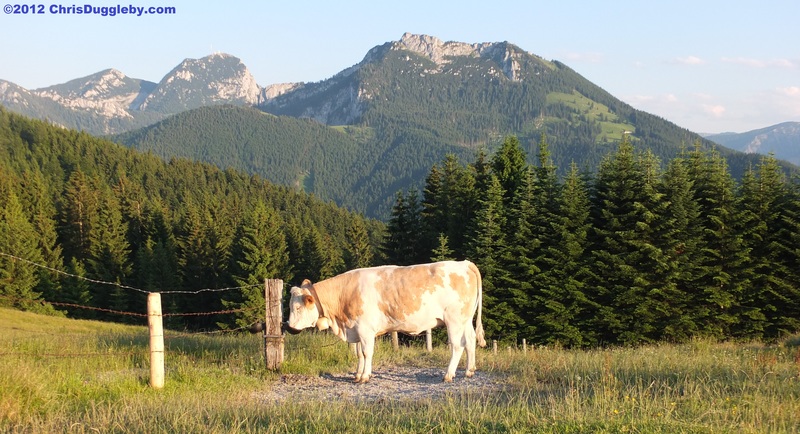 On my regular trips from the village of Bad Feilnbach up the Schwarzenberg Mountain I am often greeted at least a couple of times by the sound of cow bells. This acts as a little reminder that our four-legged friends are busy producing milk when most of us are enjoying our leisure time. 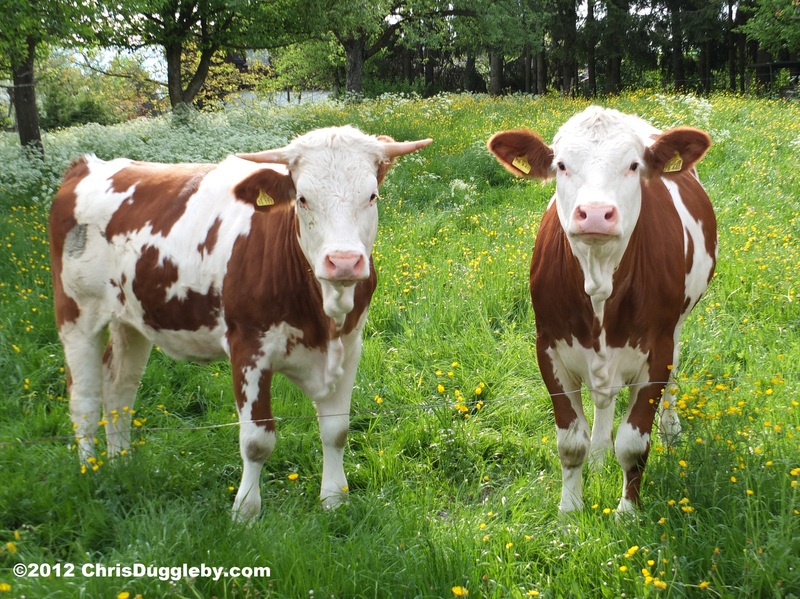 There is a meadow close to the summit of the Schwarzenberg where the cows start nodding their heads in joy and mooing friendly ‘hellos’ as soon as they see me coming up the mountain to visit them. To help you appreciate this traditional alpine scene here is a recent photo taken on the mountain pasture. As the alpine farmers’ uproar about the cow bell punishment gathered momentum the local Judge, Erich Kundegraber, even visited the location of the disturbance in Stallhofen to gather some ‘first-hand’ evidence. However this visit simply convinced him of the correctness of his judgement. He stated that the bells on cows grazing in enclosed pastures near to where people live create an unacceptable disturbance for these residents. This case creates an important precedent in the courts and there is now a risk of copycat cases being brought throughout the alpine region. Clearly the farmers and their associations are up in arms. The president of the Tirolean Chamber of Agriculture was quoted in a regional newspaper (the Tiroler Tageszeitung) as saying that: ‘if the courts have nothing better to do than sentence cows for wearing cow bells then surely we have too many burocrats’. He also said rather pointedly: ‘presumably next they are going to ban the church bells from ringing too?’. This is an issue that is not going to go away. As I popped down to the supermarket recently I noticed some of the local cows were already going about their grazing business ‘naked’. They tried to put on a brave smile but you can see from the photo below they were obviously very concerned. 100 Euros is a lot of money for a cow! If you would like to read one of the original german articles on this subject you should try the link here. Should you be interested in some of my other English interpretations of similar alpine stories please take a look in my archive using the link here.